To ensure that the baby remains comfortable while swimming and secure in the water it is important to ensure that the baby remains comfortable. A high degree of this comfort can come from the baby feeling comfortable within the clothing that has been chosen, but also in the nappies that are used throughout the swimming experience. For new parents, many are confused about the options that are available and are unsure about which nappies are the best choice while taking baby swimming. Many parents are unsure about which brand to choose, whether to choose cloth or disposable swim nappies or even how long the nappies can be worn. 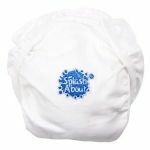 Swim nappies are essential, as they will not puff-up like traditional diapers when exposed to an excess amount of wetness. Traditional disposable nappies should not be used in a pool as when exposed to high levels of moisture, they can leak chemicals that can be potentially harmful to baby. Choose between cloth or disposable nappies for swimming. The obvious difference between the two choices is the fact that cloth swim nappies can be used over and over while disposable nappies are used only once. Cloth nappies can help parents to avoid the exposure to chemicals that can allow the bottom to remain semi-dry while exposed to water while disposable nappies are often associated with creating a higher seal to avoid leaks while spending time in the pool. Taking all of these factors into account, parents can first decide between cloth swim nappies or disposable swim nappies. 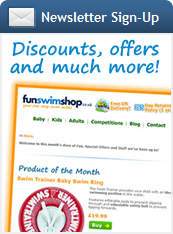 Swim nappies are available through a variety of baby stores, or disposable swim nappies can even be rented through most swimming pools. Available in a variety of sizes, they can be easily found to accommodate infant swimming activities.